DigiFeb was a series of digital events and roadshows organised to celebrate the launch of the Council’s new website and online services by highlighting the benefits of being online and helping residents further develop their online skills. 14th February was Valentine’s Day so we organised a “Love Digital” event at Offerton Community Centre. We offered a Digi-Drop in to help solve all those little problems on people’s mobile devices, we showed people how to stay safe and save money online and how to download and print photos taken on a smart phone. We also ran tutorials on Skype and ‘How to trace your family tree’. 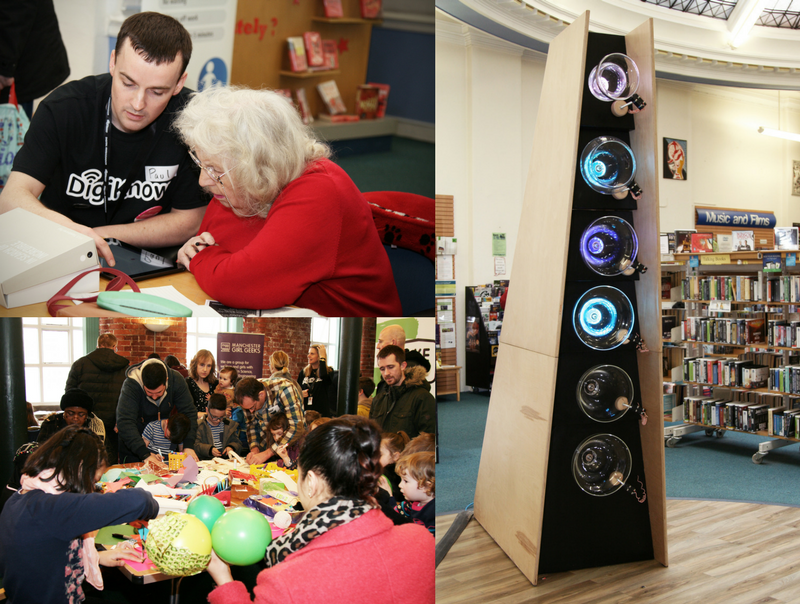 On Saturday 18th February we held our first ever DigiFest in Central Library and the Hat Works. It was a whole day of fun and creative digital activities for all ages – we had babes in arms through to octogenarians, which was fantastic! All in all we had around 800 visitors to the events on the day, mostly families with young children but also some older people who wanted help with their tablets, laptops, smart phones or e-book readers. MadLab and Manchester Girl Geeks provided lots of ‘Make stuff’ activities such as robotics, 3d printing, build a badge, wearable tech, DIY touch screen gloves and train ticket origami. 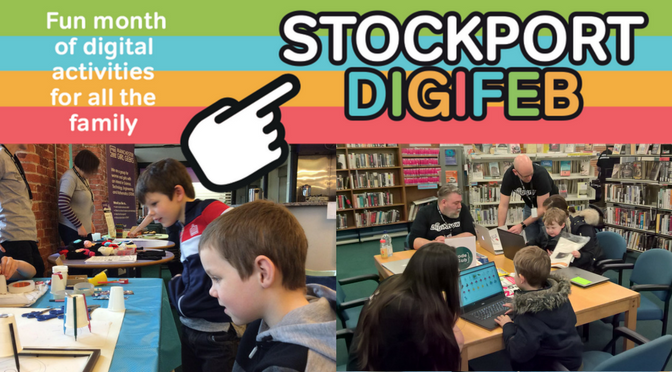 We also teamed up with Stockport Coderdojo, Code-up Stockport and DWP to offer lots of coding and gaming activities, which were incredibly popular with children and parents. ‘The Glass Work‘ digital art installation drew a crowd as photographs taken on the day were interpreted via Twitter into sound and colours, truly astonishing! Our DigiKnow volunteers were on hand in the Digi-Drop in for people struggling to get to grips with their own tablets, smart phones or other gadgets. One elderly lady brought in four devices and was so delighted with the help she received from one of our young volunteers that she asked if we could do it every week! As a result we are exploring the idea of regular ‘Tea and Tech’ sessions. We also had a team of volunteers down in MerseyWay promoting the Council’s website, encouraging people to sign up for My Account and the Stockport Review Extra and directing people to the events in the library and Hat Works. For a flavour of the day, watch this short video. Continuing Education organised a Hackfest on 21st and 22nd February, aimed at encouraging the development of coding skills in young people aged 14 to 18 and involving businesses in setting coding challenges. Participants competed in team challenges set by local businesses which use coding in their work. 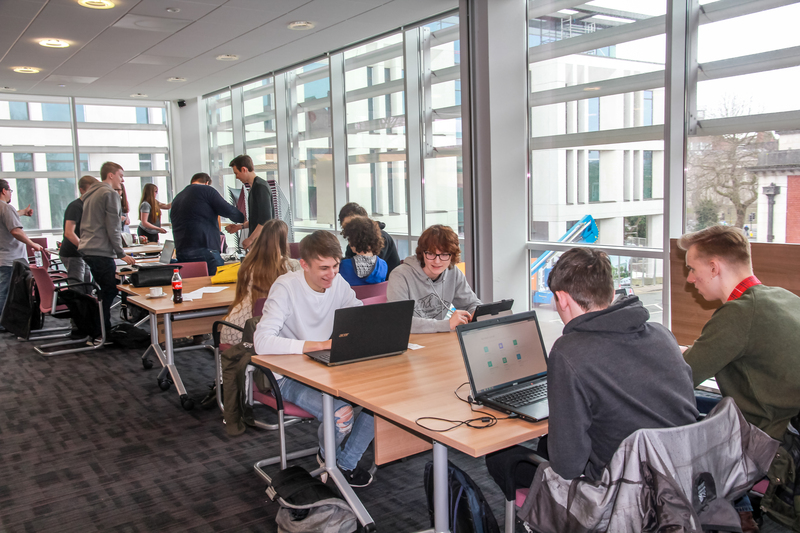 The businesses involved also provided mentors to support the young people to develop their coding skills as they worked through the challenges over the two days. The young participants involved benefitted from using and improving their coding skills as well as meeting people from business. They showed a resilient approach to using digital as they researched, found, learned and applied new skills and information to get through the challenges they were set. 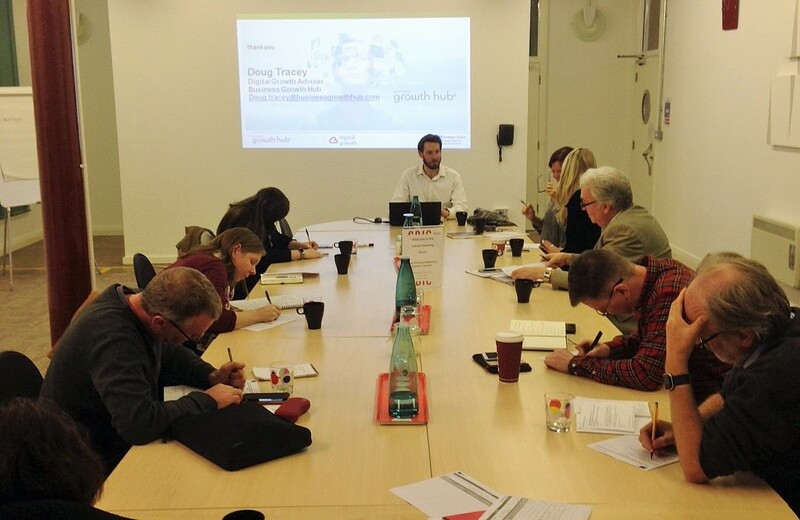 There were two digital marketing workshops for local businesses organised by the Growth Team, provided by Manchester Business Growth Hub and held at the Stockport Business and Innovation Centre on February 17th and 28th. 25 businesses attended from a range of industries, from small fledgling start-ups, to well established local construction and accountancy firms, local charity NK Theatre and the local Army Reserves unit. The workshops helped them understand how to get the best from their web presence by improving their knowledge of website development and their personal digital skills in the use of social media for business. The first workshop focused on the basics of creating a website, including search engine optimisation techniques, effective analysis of webpage traffic to identify opportunities to overcome lost customer engagements. The second workshop developed this further through tips on introducing new software and changing customer behaviour to ensure websites stay up-to-date and relevant. On Monday 27th February we held a roadshow at Bridgehall Community Centre with the themes of: finding work online, learning new digital skills and saving money online. DigiKnow volunteers were on hand to help people navigate MyWorkSearch, a job search and training tool that provides support for all aspects of looking for and securing a new job, and helps with day to day search activities. And we’ve still got the Stockport Hackathon to look forward to on Saturday 4th March, with its aim to help connect local residents with their wider community. We’ve had some great feedback from both the people who’ve attended and the staff and volunteers who’ve helped out at all of the events. Everyone has enjoyed learning something new, making digital stuff and getting help with their devices. At all the events we have promoted the Council’s new look website and encouraged people to sign up to My Account and shown them how to use the Report it and Apply for it functions. DigiFeb has been a great success and we can’t wait to do it again later in the year – so watch this space!